If a person is not married but has a child, a paternity action may become necessary to establish child custody, visitation, or child support. At the Law Offices of Michelle Evans, we help both mothers and fathers who are either trying to prove paternity or contest it. No matter which side you are on, you can benefit from having an experienced California family lawyer to guide you through the process of a paternity action. As with all legal actions, paternity cases can be complex so it helps to have legal support and guidance on your side. Paternity is the legal identification of the father of a child. Paternity is always an issue when the parents of a child are not married. Even if one party admits to being the father of the child and they are listed on the birth certificate, legal paternity must still be established by the court if the parents are not married. Once legal paternity is established, the acknowledged father will gain his legal rights to his child as well as take on the responsibilities of child support. 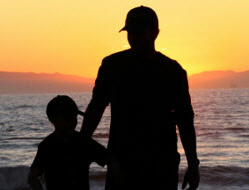 In Santa Barbara and Ventura County the law is clear that there is a compelling interest in establishing that there are both a mother and father for each child. Under the family law code, the establishment of paternity is the legal procedure for the award of custody, visitation and child support. There are only three issues in any paternity case: child custody; child visitation and child support. The establishment of the legal relationship via paternity is also important for the child to obtain benefits through the father including social security, military benefits, health insurance and inheritance rights. For more information regarding filing a paternity petition, setting aside a paternity judgment, or to discuss the consequences or ramifications of a paternity suit, we invite you to schedule a free confidential consultation with an experienced paternity lawyer. We have offices in Ventura and Santa Barbara. Get answers – start by calling us at 805-242-6270 or e-mail.